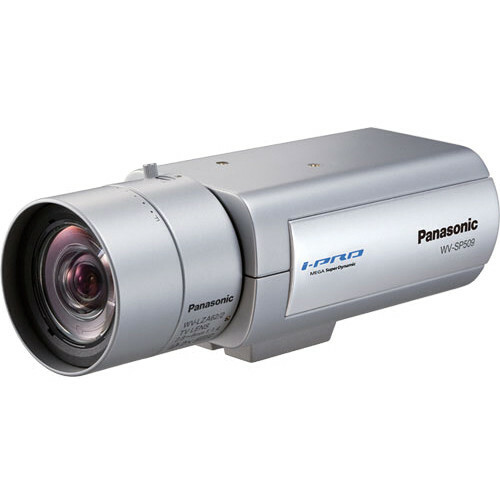 The Panasonic POCSP509LMP24 Full HD Network Camera with 2.4 to 6mm Auto-Iris Lens delivers full HD images and 360p images simultaneously. Panasonic’s UniPhier S generation LSI processor provides simultaneous cropping of whole and part images, lower bandwidth storage requirements, more VIQS (Variable Image Quality on Specified areas) zones, dual H.264 streaming capability, and overall high-level functionality. VIQS, combined with efficient compression, enables network bandwidth reduction by decreasing the image quality for less important areas in a video frame (such as the sky), while retaining image quality for critical parts of the view. Face detection analytics detect the position of a human face and send the information via a video stream. ABF (Auto Back Focus) allows easy installation and stable focus in color and black & white modes. Note: Code label may be required for network management. The network administrator shall retain the code label. Refer to notes on Windows Vista/7 on the provided CD-ROM for further information about system requirements for PC. When using IPv6 for communication, use Microsoft Windows 7/Vista. HTransmission for 2 streams can be individually set in the same compression method.